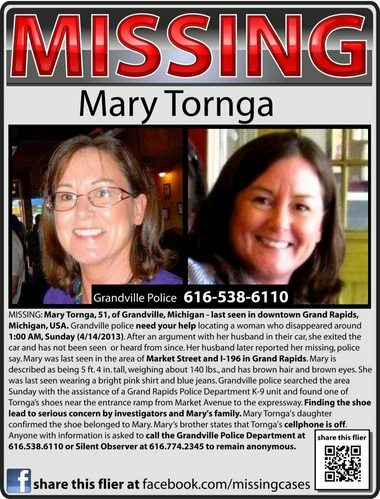 51 year old Mary Tornga has been missing since 1 am Sunday morning, April 14, 2013, in Grandville, MI after she had an argument with her husband. The husband says they were driving home from a birthday celebration in Grand Rapids, when Tornga got out of the car near Market Street and I-196. She has net been heard from or seen since. Tornga is 5 feet, 4 inches tall and weighs about 140 pounds. She was last seen in a bright pink shirt and blue jeans. At this time the Grandville Police say Tornga’s husband is not considered a suspect. Grandville Police will continue the search for 51-year-old Mary Tornga, Tuesday. Police found a shoe belonging to Tornga during an earlier search. The Grandville woman disappeared around 1 a.m. Sunday after an argument with her husband. The husband says they were driving home from a birthday celebration in Grand Rapids, when Tornga got out of the car near Market Street and I-196. She hasn’t been seen since. Monday, The Michigan State Police used a helicopter to search up and down the Grand River. If anyone with information that may help police in locating Mary Tornga is asked to contact Grandville Police Detective David Huizenga at 538-5110.